If you’ve been following along with our How to Refresh Your Computer series then your computer should be sparkly clean, be de-cluttered file-wise, and should be running a little bit faster. If you haven’t been keeping up with this series, we recommend you read Part One, Part Two A, and Part Two B to catch up before continuing. While this article may be the last in the series, it is no less important than other steps. Maintaining your hardware is a good way to ensure your computer’s longevity and may help you avoid costly repairs in the future. Have you ever looked at the back of a desktop computer that’s been in one spot for a while? What do you notice about it? For most people, it’s probably the pile of dust caked around the fan. But when you notice a pile of dust on the back of your computer, it means a larger problem is brewing– your computer is probably twice as dusty inside. Computers aren’t air tight, they aren’t meant to be. Air needs to flow to allow hot air out, and cool air in. But, if air can get in, dust can too. And over time, this dust can build up and become a fire hazard. Luckily it’s easy to clean out your case. All you need is some canned air, and a nice sunny day. Turn off your computer. Once it’s completely shut down, unplug the power and all other cords. If your monitor(s) sit on top of your tower, remove them. Then, take your computer and your canned air outside. Open up the case. Each case is slightly different, but typically there are screws on the back that hold the side panels on. Removing the screws should allow you to slide the panel off. You’ll want to slide off the one that gives you the best access to the case (as opposed to the side with all the components and cards against it). Once the case is open, take your canned air and spray that sucker out. If it’s really dusty, you may want to stand back so you don’t inhale the dust. Spray out any place with dust, including fans, boards, holes in the case, and more. When all the dust is gone, put the side panel(s) back on, attach the screws, bring it inside and plug it back in. While technically not “cleaning”, another thing you can do to clean up your computer is to consider getting updated hardware. If your computer is a little slower, or if you have a laptop, consider getting a solid state hard drive (SSD), which runs faster than traditional drives. You could even get a hybrid hard drive, which combines traditional drives with solid state drives, giving you the best of both worlds. Please note however that SSDs are still new, and may not have the same storage capacity as its traditional counterparts. If your computer runs noticeably slower, consider getting more memory. Most of the time, a little extra memory goes a long way in speeding up the computer. To check how much memory you currently have, right click on Computer (or My Computer) and select Properties. The amount of installed memory will be listed toward the middle of the page. Should you decide to upgrade your memory, you also need to check your computer specs to determine the maximum amount of memory your computer can handle. Not all computers can handle the same amount, and you don’t want to buy memory only to find out you’re already at your max, so check this first before purchasing anything. One other quick tip about memory – it should be paired. So, if you may need to purchase two sticks of memory to ensure proper pairing. If you have one three gig stick installed, you shouldn’t just add one gig to the system. Instead, two 2-gig sticks of memory will give you better performance. And that’s it. If you’ve followed our entire series, your computer should be sparkly clean, and faster than before. Remember to bookmark these tips so you re-visit the procedure at least twice a year. Julie Strier is a freelance writer who believes that a fast computer makes for a happy computer user. Email:julie@mybusinesswriter.com. Website: www.mybusinesswriter.com. It may still be cold in parts of the U.S., but in Florida it’s already beginning to feel a lot like spring, which naturally leads us to think about one thing – spring cleaning. But did you know that it’s not just your environment that could use a good cleaning? Your computer could probably use one as well. Whether it still feels like winter where you are, or whether it’s starting to warm up already, taking some time to clean your computer now will ensure you’re ready and prepared to take on the coming year. Our spring cleaning series breaks down the various steps of cleaning your computer into easy, manageable chunks, so you don’t have to spend days and days cleaning your computer. Instead, follow the series and perform the steps outlined. By the time the series is done, your computer will be cleaned up and running good as new, and you’ll be ready to handle anything the year throws at you. Part one of the series focuses on physically cleaning your computer. Did you know that your computer, and specifically your keyboard and mouse, are some of the dirtiest places in your office? In fact, your keyboard could be dirtier that the toilet. Eeewww. And you touch it several times a day. Instead of letting germs and bacteria fester for another year, take some time to clean your computer. Your body will thank you. Important Note: Never spray anything directly on your electronics. Instead, spray your cloth, then wipe the device clean. While you can leave your devices attached, it’s best to detach keyboards and mice so that they don’t activate programs and commands on the computer while you’re cleaning. This includes both wired and wireless devices. After disconnecting your keyboard, turn it upside down and shake it out. This will remove any large debris, such as food crumbs, hair, etc. Then, spray the keyboard with canned air, removing any additional large debris. If you have an electronics vacuum, use it on the keyboard now. Once all the big crud is removed, there will probably still be spots that need some deep cleaning. Dip a cotton swab lightly in Isopropyl Alcohol, and spot clean any heavy gunk. Make sure that the swaps have enough alcohol to clean with, but aren’t dripping wet. Continue cleaning until your keyboard is sparkling clean. Repeat this process every few months, particularly after a cold or illness to remove any residual germs. Wipe down your mouse with a microfiber cloth to remove any large particles. Remember to wipe down both the top and underside of the mouse. Otherwise, wipe down your entire mouse. For any stubborn spots, clean with a cotton swab dipped in alcohol. Repeat until your mouse is sparkly clean. Even screens get dirty from time to time. First, clean your screen with canned air, to remove any large dust particles. Then, clean your screen using LCD wipes, or a soft-dust free microfiber cloth. Moisten the cloth with a mix of distilled water and white vinegar, and wipe the screen in circular motions. Wipe until your monitor is clean and streak free. Repeat every couple of months, or when your monitor is dirty again. Note this will work for LCD TV’s too. Once all your peripherals are cleaned up, it’s time to clean the outside of your computer. Shut down and turn off your computer. 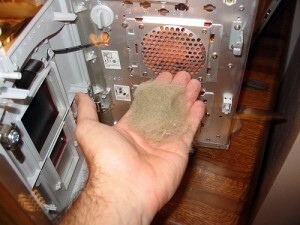 Using the canned air, clean any fans, air intakes, or other areas on the outside of the computer that is collecting dust. 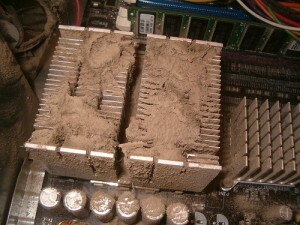 If your computer is super dusty, take it outside to clean. Then, gently wipe down the outside of the case with a microfiber cloth. Clean any stubborn spots with a cotton swap dipped in Isopropyl Alcohol. If you have a laptop, remember to clean really well between your keys, your touchpad, and any other area that is frequently touched. Stay tuned for our next installment of the Spring Cleaning Series, where we’ll focus on cleaning the inside of your computer. Julie Strier is a freelance writer who believes that a clean computer is a happy computer. Email:julie@mybusinesswriter.com. Website: www.mybusinesswriter.com.